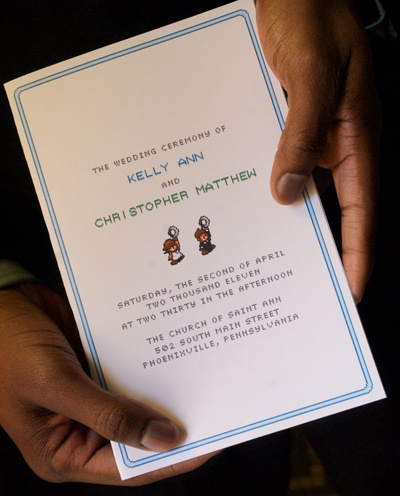 The event programs, like all of our printed wedding materials, were designed pixel-by-pixel at a minute resolution. We used the same visual theme here as on all signage at the wedding and reception: a blue border and the typeface from Capcom's Strider. Detail text was printed in Pixelette. The design was tied together by yet another pixelated rendition of ourselves, this time holding up our newly acquired rings while doing our best Link impersonations.